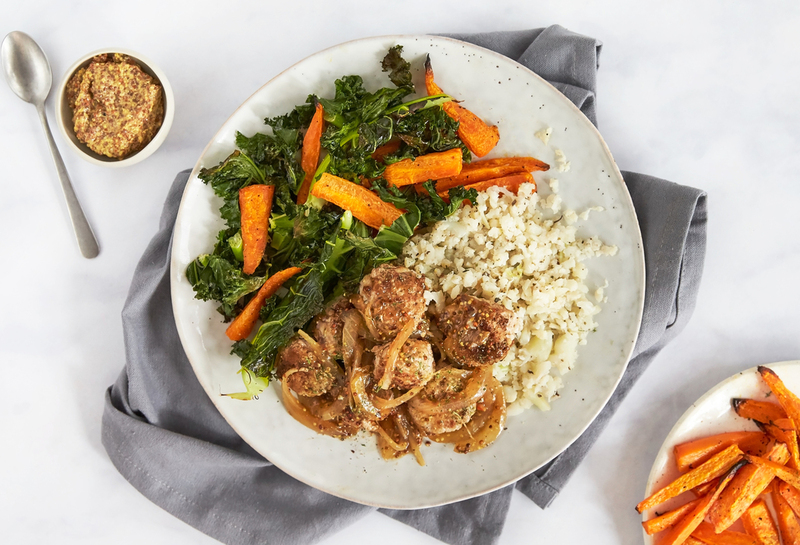 Sweet and tangy, these pork meatballs are infused with grated fresh apple, wholegrain mustard and fragrant fresh sage, to help aid digestive health. They are served with our favourite, crispy kale, alongside sweet roasted carrots and cauliflower mash. 1. Preheat the oven to 200C / gas mark 6 and boil a kettle. Slice the apple in half, remove the core and finely grate half of the apple. Thinly slice the onion. Cut the carrots into small batons. Roughly chop the kale. Finely chop the sage leaves. Remove the cauliflower leaves from the cauliflower. 2. Place the carrots on a baking tray, drizzle with 1/2 tbsp oil and place in the oven for 25 mins. After 15 mins, add the cauliflower leaves and kale to the same baking tray with 1/2 tbsp oil for the remaining 10 mins. 3. Cut the cauliflower into small chunks. Place in a saucepan and cover with boiling water. Simmer for 20 mins until soft, then drain and mash with a potato masher. Season and stir in the leaves from the thyme sprigs. 4. In a bowl, mix together the pork mince, apple, chopped sage and half of the mustard. Season with sea salt and black pepper. Roll the pork mix into 12 meatballs. 5. Heat a frying pan on a medium-high heat with 1/2 tbsp oil and cook the meatballs for 10 mins, turning occasionally until golden brown. Remove from the pan. 6. Dissolve the half stock cube in 150ml boiling water. Dissolve the cornflour in a small bowl with 1 tbsp cold water. In the same pan that the meatballs were in, heat 1/2 tbsp oil on a medium heat and cook the onion for 5 mins, then stir in the vegetable stock, cornflour and remaining mustard. Add the meatballs and place a lid on the pan, cook for 5 mins until the meatballs are cooked through. 7. Spoon the pork meatballs and sauce onto two warm plates alongside the cauliflower mash, carrots, kale and cauliflower leaves.